Members of our marketing automation team recently attended the 2018 Email Evolution Conference held by the Data & Marketing Association in New Orleans. The conference was not only filled with brass music, delicious beignets, and oysters, but key insights, strategies, and frameworks. We’ve highlighted our five key takeaways from the conference to help you create a better email strategy. In this pre-workshop session, the conference reinforced what we’ve known to be one of the most important goals of email campaigns, personalization. Over time, users continue to engage with content that’s more personalized to their interests. However, you must learn the interest of your users’ over time in order to send them the content they desire. This can be achieved through a well-thought out email campaign and by utilizing the five levels of emails. Understanding each of the five levels will help you develop new content that creates more opportunities for better conversions. Foundational emails are for umbrella messaging, are typically sent to an entire list or a broad segment, and contain content that covers a wide range of topics. These are the least personalized emails. The communication baseline to foundational emails is to maintain a channel relationship. Its purpose is to create continuity. Promotional emails are used to generate revenue, whether its directly or indirectly. These emails generally help raise awareness of merchandise, products, and services available. They include demo or free trial business models to encourage users to take the first step in engaging with your product or service offerings. These emails should also promote urgency, brevity, and like all emails, have a clear CTA. Informational emails are used to maintain relationships over time. These emails guide subscribers into a deeper relationship by informing, teaching, and serving prior to a sale. Try leveraging content you’ve already developed, such as any white papers, blog posts, etc. Informational emails are also used as great breaks in between promotional messaging. Engager emails are effective at reactivating inactive users by collecting feedback and developing a conditioned pattern of response to low-commitment actions, such as a survey. They are also used as a break from promotional and content-heavy emails. As the second closest level to personal emails, they are extremely audience-focused and experience-centric. Personal emails respond to a specific action, lack of behavior, or personal characteristic. The action or topic is at the individual’s level. Your goal is to reach the right person at the right time. Try recognizing personal milestones for your user, such as birthdays, anniversaries, reorders, etc. You want to personalize these emails with as much details as possible, from addressing them by name to mentioning a previous product or service they were interested in. The key is to have dynamically-customized content so the user feels as if they are an audience of one. As email experts, we know there are countless ways to create an email marketing strategy. Here, we will review an easy five-step approach to creating your next email marketing strategy. Assess your current email marketing program by referring to the five levels of an email campaign we covered above. Do you have emails that fit within each of the level? How frequently are they being sent? This step allows you to get familiar with your current campaigns and identify which emails are doing a better job at converting than others. If you don’t have an email marketing program currently running, you’ll skip this step. Now that you’ve assessed your current email program, start brainstorming new (or drastically overhauled) campaigns that are needed. You’re going to want to brainstorm as much detail for each campaign as you can. 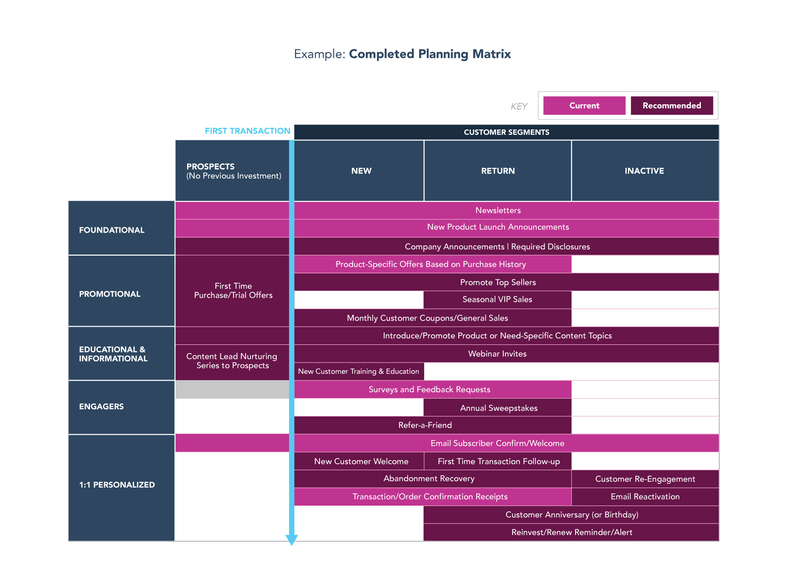 Start entering your current and newly brainstormed campaigns into a matrix. You can refer to the matrix we’ve included in this blog. 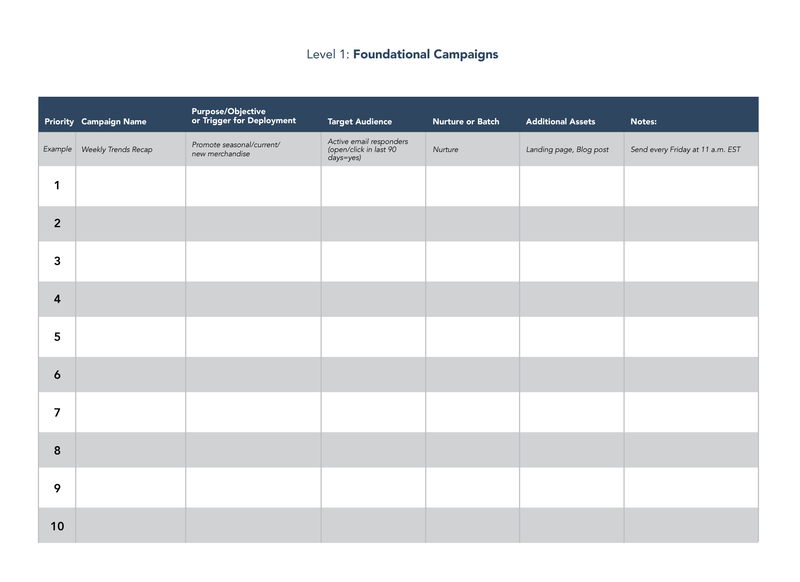 This helps you identify any gaps in your campaigns or if you have a large amount of campaigns for one target audience over another. Areas of white space are areas of opportunity, meaning, you can focus on those areas when create new campaigns for your email programs. Plot your new email campaigns into four quadrants, using something similar to the graph below. The x-axis represents the level of effort it takes to create the campaign, whereas the y-axis represents the revenue opportunity. Allow some campaigns to cross lines between quadrants if you’re unsure. Next, take a look at the four quadrants you created. 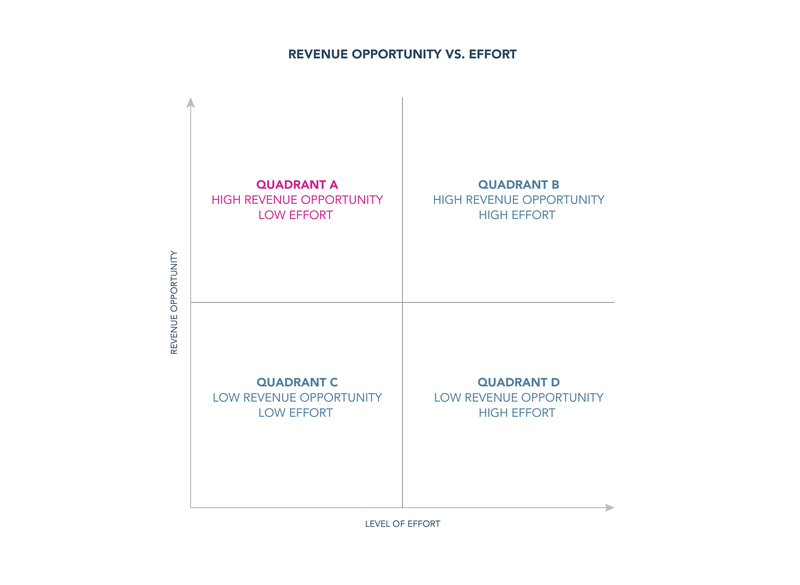 The upper-left quadrant is referred to as the “sweet spot.” These campaigns are the ones you should tackle first since they have the highest revenue opportunity and require the least amount of effort. Probably the driest but most valuable workshop was on Global Compliance, the General Data Protection Regulation (GDPR) and Canadian Anti-Spam Law. We were looking forward to this workshop because we know there is a lot to understand since the regulations are not clearly defined. Having other experts available to clarify and even interpret the different regulations was invaluable. The room was tense as we started our talk about GDPR, the EU’s General Data Protection Regulation, and for good reason. With fines up to 4% of annual global turnover or 20 million euros, it’s a big deal. Contrary to the U.S. and other parts of the world, in Europe data privacy is seen as a human right. In the past, the EU has had separate privacy directives across their 28-member countries. Instead of 28 directives, GDPR is an agreement between all countries to just one set of laws pertaining to privacy, which means these laws become enforceable by law. You might be thinking, “My business isn’t based in Europe, so GDPR doesn’t affect me.” Wrong. GDPR regulations apply to organizations located within the EU and to organizations located outside of the EU if they offer goods or services to, or monitor the behavior of, EU data subjects. There is a lot of information to go through, but here are some details of the most applicable regulations. Affirmative consent must be “Freely given, specific, informed, unambiguous.” This must be an unchecked, opt-in field. Clear information must be presented concerning who is collecting the data and for what reason. Ability to withdraw consent easily. You must provide access to unsubscribe. Children under 16 need parental consent. Existing consent needs to meet GDPR standards. You have till the deadline to re-establish consent. Right to be forgotten. This means erasing data without “undue delay.” Unless there are legal reasons that the controller needs to keep it. Profiling and the right to object. “Automated” processes that assess or predict things such as: performance, economic situation (e.g, credit), health, personal preferences, interests and behavior, location and movements. Increased level of detail in Privacy Notices. Must be concise and readable. Provided at the time of data collection and explains the period personal data will be stored for, contact details for the data protection officer, the right to complain to the supervisory authority, etc. First Canada, then the EU… who will be the next to implement privacy laws for individuals? The general consensus at the conference was that by not attempting to treat Canada and the EU separately, your organization has the opportunity to put global privacy rules into practice. Adoption of these practices will not only prepare you for any future legislation but will allow you to build trusted relationships with your customers. One of the proposed regulations that aligns with GDPR is the ePrivacy Regulation. This has to do with the processing of Electronic Communications Data (ECD) and is broken into two parts: Electronic Communications Metadata (ECM) and Electronic Communications Content (ECC)—both pertain to the collecting and processing of data. The biggest change proposed was regarding cookies and other technologies that collect or store data on devices, including laptops, tablets, phones, and connected devices. The proposed change would require the ability for an individual to withdraw consent from first-party technologies, and a reminder that they have the opportunity to do so every six months. Prior consent isn’t required if the cookies are used to access websites, recognize language or preferences, provide services like a shopping cart, or are first-party web analytics such as Google Analytics. It is important as an organization to understand the difference between third-party cookies and first-party cookies. Third-party cookies require explicit consent, while first-party cookies require an option to opt-out. This will affect how you set up digital advertising campaigns. But don’t go running for the hills, yet. The adoption date is pending, and the law is still not defined. In the meantime, continue to stay abreast of all changes to ePrivacy. Between the hands-on workshops, practice sessions, networking events, inspiring keynotes, and getting our fill of BBQ Shrimp Po’Boys, Sazerac, and New Orleans jazz, we had a number of best practice, compliance, content generation, and creative tips to look back on. We’ll see you next year in Savannah, Georgia!